Between a Russian sailor and bold Jack Morrisy. What do you say, will you consent to have a round with me. And in honor of old Paddy’s land I’ll still those laurels wear. They swore the Russian sailor boy would kill bold Morrisy. That was to be the champion’s prize that gained the victory. With English, Russian and Saxon cheers the valley did resound. From that until the twentieth theRussian he put down. He said it was quite useless, he would never fight again. To brave Jack Morrisy and Paddies evermore. This ballad has been found in Ireland and also in the Canadian Maritime provinces but the version here (like last month’s song) comes from Minnesota’s Mike Dean. It is the only version collected from a singer from the Great Lakes region. Dean’s text was printed in his own song book in 1922. His text and melody were printed in Franz Rickaby’s Ballads and Songs of the Shanty Boy in 1924 and then reprinted in 1927 by the famous poet, author and folk-song enthusiast Carl Sandburg in his enormously popular book the American Songbag. 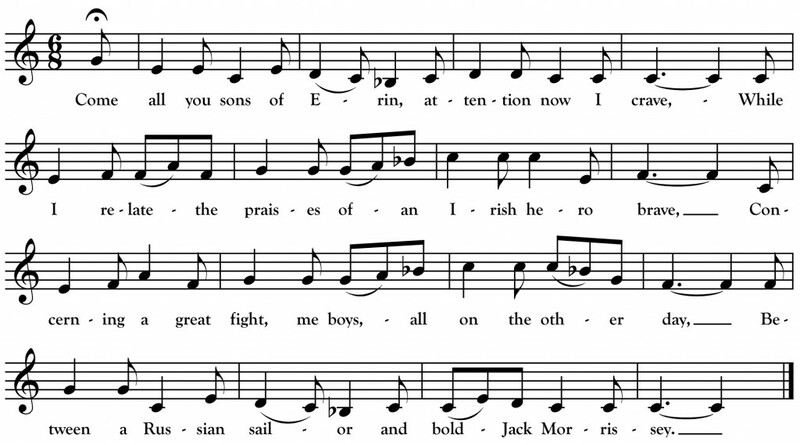 Sandburg used Dean’s song to illustrate the popularity of Irish songs and Irish singers in the lumber camps. Indeed, the ballad’s hero is the famous Irish-born, bare-knuckle boxer John Morrissey who came to Troy, New York with his parents in 1833 at the age of two and whose colorful life stands as a testament to the wild ups and downs experienced by freewheeling Irish immigrant men of his generation. Morrissey was an Irish gang member in his youth, a prospector in the California gold rush, the champion heavyweight boxer of the world, a casino tycoon and a member of the U.S. House of Representatives. However, it seems that his fight with the “Russian Bear” was probably a fictitious creation of a ballad maker. Alan Lomax captured the essence of a “party piece” performance of “Morrissey and the Russian Sailor” on a visit to Ireland when he recorded Seán ‘ac Dhonnchadha singing a version with a similar text but different air (amid wild cheers of encouragement from the “audience”). You can hear that on World Library of Folk & Primitive Music, Vol. 2: Ireland. It’s well worth a listen! [i] Nelligan, John Emmett. A White Pine Empire: The Life of a Lumberman. St. Cloud: North Star, 1969, p. 12. [ii] From The Ballad of Mickey Free as printed in Dunn, Kames Taylor. The St. Croix: Midwest Border River. Minnesota Historical Society Press, 1965, p. 254-256.